With your help, Koinonia Farm is planting a new 40 acre pecan orchard. That is 800 new pecan trees! We are looking to find happy sponsors for everyone of these 800 trees. 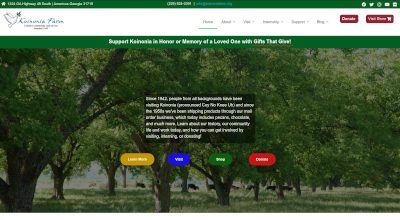 Make a tax-deductible donation of $150 per tree and this will allow Koinonia to prepare the soil, set up the irrigation, acquire needed supplies, tools, and equipment, cover biological amendments for three years, and purchase the tree itself. As with all our orchards, these trees will be kept happy and healthy with only biological methods. We work from the soil up using compost tea and other amendments. Healthy soil means healthy food for the trees and for those who buy our pecans. Donors receive a certificate and a location of the tree planted in the new orchard. To sponsor multiple trees, simply change the quantity below. Also, consider donating in honor or memory of others. I had wanted to sponsor a tree since the last time you made the offer, when I didn't try in time. So I am very happy I got to make the donation now. Koinonia means a lot to me, although I have never been there. It is an important part of the fabric of the Civil Rights movement in the south, and I have found joy in its continuing mission. Kononia has expanded its mission while remaining true to its beginnings. Thank you for all you do, from the past to the future.